What should you eat for proper pH levels? Nutritional recommendations are as varied as political and religious beliefs and, sometimes, held to just as stridently. Cordain tries to rise about the controversies by looking to our biological and genetic heritage. He points out that people, until relatively recently, were hunter-gatherers whose diets consisted of a combination of lean animal foods (including fish) and uncultivated vegetables and fruits. Based on his analyses of the diets of 229 pre-modern cultures, Cordain has calculated that the "average" ancient diet consisted of 55 percent animal foods and 45 percent plant foods. The animal foods included healthy fats as well as protein, and the plant foods consisted of leaves, stalks, fruit, seeds, tubers, and roots. Grains and cow's milk didn't enter the picture until about 7,000 to 10,000 years ago, too short a time for genetic adaptation. Cordain's recommendations, found in The Paleo Diet and The Paleo Diet for Athletes include too many veggies to be a knockoff of the Atkins' high-protein diet. (Eating very lean meats, he adds, reduces saturated fats amount to only 10 percent of calories.) Nor do you have to be a vegetarian to gain the alkalizing benefits of fruits and vegetables. 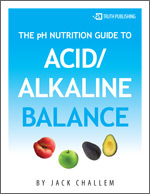 "It takes about 35 percent of total calories as fruits and veggies to produce a net alkaline load," he explains. "What's so hard about one-third of your plate being veggies?" Still, if you have visions of veggies coming out of your ears, the answer is really simple. Cordain, Sebastian, and Brown suggest cutting back on breads, pastas, and other grain-based foods, as well as "high-glycemic" foods such as potatoes. They're all nutrient-poor foods, compared with protein and veggies. "It's all another scientific justification for what your mother always told you," notes Brown. "Eat your fruits and veggies." You can test your own pH simply and inexpensively. All you need are some pH test strips. Tear off two three-inch strips. As you as you awaken, before you drink or eat anything, put some saliva on the test strip. Compare the color to a pH color chart that comes with the test strips. Next, measure the pH of your second urination of the morning. To do this, urinate on the strip or collect the urine in a plastic or glass (not paper) cup and dip the test strip. Again, compare the color to the pH color chart. Decker Weiss, N.M.D., of Scottsdale, Arizona, recommends doing the saliva and urine tests for 10 mornings in a row. "Ignore the top three and bottom three tests because they're extremes. Average the remaining four to determine your pH," he says. Weiss aims for a pH of 6.8 to 7 in his heart patients, and 7.2 to 7.4 in his osteoporosis patients. You can retest a few weeks after changing your eating habits. You can order the test strips from www.alkalineforlife.com or by calling 888.206.7119. One roll, which is good for a few dozen tests, is $13.95.